Madalina Marcu is the Resource Development Director in ARC where she has worked for the past 11 years. Her role is to mobilize resources for ARC’s activity, build relationships with donors and people of influence and affluence who could support ARC’s mission, represent the organization in advocacy processes, media, events that can affect ARC, the NGO sector or the field of philanthropy. With over 15 years of fundraising experience and 5 years in philanthropic counseling, she has delivered fundraising trainings, has worked in consultancy and mentorship with fundraisers and NGO leaders and has advised individual donors. 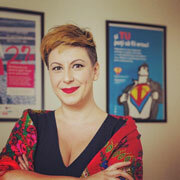 Madalina has been the campaign manager for the first major donors endowment campaign implemented in Romania and her expertise varies from corporate fundraising, major donors to special events. She worked as a fundraiser and communication specialist in ARDC (Romanian Association for Community Development) and Princess Margarita Foundation. She sat on the Board of PACT Foundation and is an active member of the Romanian Business Leaders Foundation Board. The Association for Community Relations (ARC) works for over 17 years in developing philanthropy in Romania. We believe philanthropy is a social change mechanism. We work with all those who are searching for resources to help their communities, with those who want to invest their resources for transforming lives and we build mechanisms that make the resource transfer simple and efficient.